Many people ask if OfficeKey is a coworking space. The simple answer is yes. The coworking industry has many definitions but can essentially be described as the flexible use of an office by people who are self-employed or working for different employers in order to take advantage of the shared resources of space, equipment and support services. The industry has evolved very rapidly over the past 5 or so years and has produced many different types of niche operations. Many of these coworking spaces focus first and foremost on the “co” part of coworking, that is the community aspect of things. While OfficeKey certainly incorporates a vibrant and connected community, that is not the main driver. We like to categorize ourselves as being in the “proworking” niche. The “pro” indicates a primary focus on providing a space that is professional and productive. 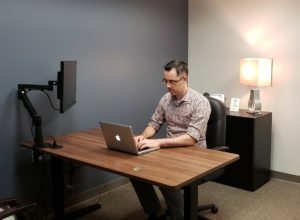 We certainly have a great community that we hope all of our clients will plug into, however that is secondary to setting them up for success in their business by creating a space that represents them well, provides distraction-free work and meeting space and a support staff that is second to none.